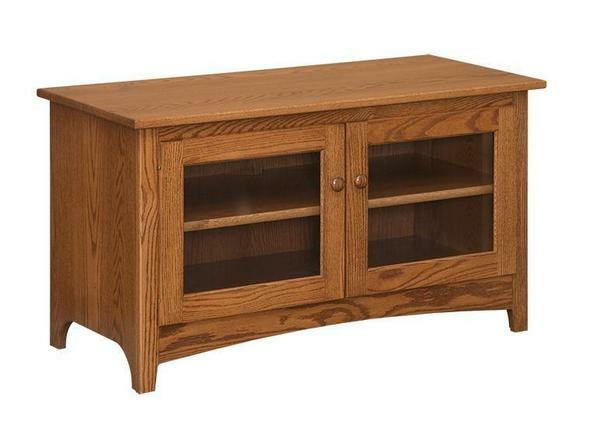 The clean design and solid construction of our Amish 46" Shaker TV Stand will make it a stand out in a living room or office that may be lacking in space. Measuring 46" wide, this Shaker-style television stand features two doors with glass panels. Behind the doors you will find an adjustable shelf and a cord hole located in the center back of the cabinet. A gentle arch at the front and cut out arches on the side help to form the legs and base of the piece. Have this TV stand custom-made from oak, cherry, or brown maple to make it yours.